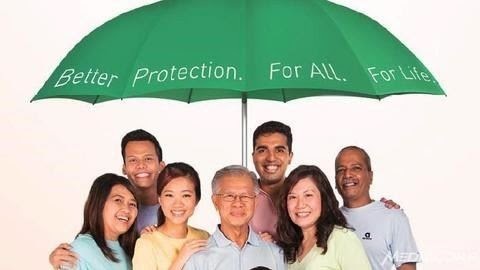 Since last year, there are two CPF initiatives/topics which created quite a buzz among the public. One being the ever popular Minimum Sum Requirements for the CPF Life and the other one is the upcoming Medishield Life revamp (akan datang in end-2015). This afternoon, attended an industry briefing on Medishield Life conducted by MOH (Ministry Of Health) and thought it might be a good idea to share some salient pointers/tips that I've gathered from the session. Among all types of insurance, personally think the most important one is Health Insurance, hence, I believed many of you are equally interested in knowing more about what to expect from MOH/CPF in the coming months. Before that, for the sake of those who are still clueless of what is Medishield Life, maybe I should just briefly go through some basics here. 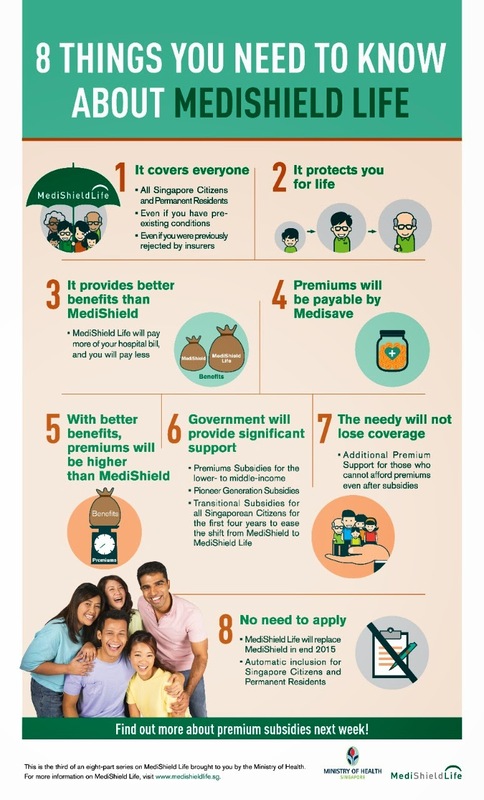 Medishield Life (currently known as Medishield) is a National Health Insurance Scheme administered by CPF Board. It is aimed to cover big medical bills (mainly for hospitalization and/or chronic outpatient treatment coverage). One of the key feature of the scheme is that you can use Medisave to pay the premium (up to a certain withdrawal limit). 4. During the transition period, there will be a couple of subsidies that the Government will be giving out to lessen the impact of the higher premiums. 1. One of the subsidies that the government is providing is called "Low-Medium Income Household subsidy". As the name implied, it is catered for those low-medium income citizens/PRs and one of information they are using to determine the eligibility is the "household income" of the individuals (from the relevant government databases). Hence, it is important to ensure that the household composite in their database is accurate. In the month of Mar/Apr this year, MOH will be sending out mailers to us to update our record/address (clue : if your NRIC does not reflect your current address, it means that your record is NOT up-to-date). So, you are advisable to do the necessary update ASAP. 2. If you are anxious to know your estimated Medishield Life premium, you can go to this calculator to self-help. You will be given with the estimated premium (after the necessary subsidies) for the first 5 years. a. Do you need to choose your own doctor or staying in the air-conditioning wards? (bearing in mind that B2/C class wards are without air-conditioning and you are not able to choose doctor). c. Can you afford the premium in the long term? Note : All the above-mentioned information is as accurate as the time of publishing. Thanks for the good info! I'm more interested to see if the integrated shield plans will increase their premiums and by how much. Just a q, do u know if the pte companies are also required to take in anyone without may exclusions, just like medishield life? Hi LP : good that you find this useful. Private insurers will not increase their IP premium for the first year (2015/2016). However, as the Medishield Life's premium will be increasing, so overall premiums will be higher even though IP portion remain the same. But this increase will be subsidized by the government during the transition. No, the pre-existing/exclusion of the IP portion will still be up to the individual insurers ie MOH doesn't dictate that all IP must cover pre-existing conditions. Hi Richard, thanks for the prompt reply...hmm, if that's the case, I don't see why they should even raise their premiums for the pte companies. It's like they have the best of both worlds - high premiums for everyone, yet have the ability not to accept people with pre-existing conditions!